Ethnopharmacology is one of the world’s fastest-growing scientific disciplines encompassing a diverse range of subjects. It links natural sciences research on medicinal, aromatic and toxic plants with socio-cultural studies and has often been associated with the development of new drugs. The Editors of Ethnopharmacology have assembled an international team of renowned contributors to provide a critical synthesis of the substantial body of new knowledge and evidence on the subject that has emerged over the past decade. Divided into three parts, the book begins with an overview of the subject including a brief history, ethnopharmacological methods, the role of intellectual property protection, key analytical approaches, the role of ethnopharmacology in primary/secondary education and links to biodiversity and ecological research. Part two looks at ethnopharmacological contributions to modern therapeutics across a range of conditions including CNS disorders, cancer, bone and joint health and parasitic diseases. The final part is devoted to regional perspectives covering all continents, providing a state-of-the –art assessment of the status of ethnopharmacological research globally. 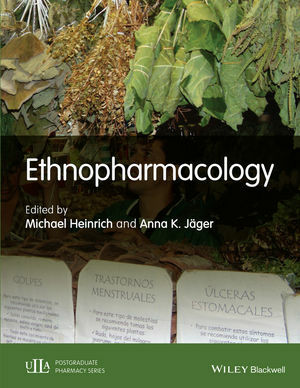 A comprehensive, critical synthesis of the latest developments in ethnopharmacology. Includes a section devoted to ethnopharmacological contributions to modern therapeutics across a range of conditions. Contributions are from leading international experts in the field. This timely book will prove invaluable for researchers and students across a range of subjects including ethnopharmacology, ethnobotany, medicinal plant research and natural products research. Professor Michael Heinrich, UCL School of Pharmacy, UK. Dr Anna K. Jäger, Department of Drug Design and Pharmacology, University of Copenhagen, Denmark.